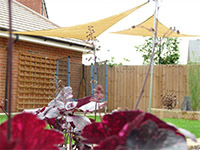 More recently, the garden makeover has become the most popular way of increasing the value of property, and along with the realization that the garden doesn't just need to be somewhere to hang the washing out or for the kids to play, undoubtedly our most popular product is the makeover. Patio heaters, hot tubs along with relaxing lighting allow this "room with a view" to become an enjoyable area all year round, day or night. We offer maintenance services to both business and private sector. Not just for grass cutting, but also total garden maintenance, pond and water features, annual pruning, planting, shrub moving, tree felling etc. 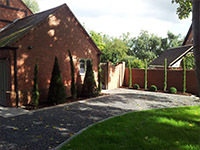 Any garden / landscape project or problem that you face, we can offer the solution. Patios, ponds, decking, focal points, seating areas, driveways, fencing, laying turf, design work, heavy garden work etc. "This new living space has enhanced the entire property and I commend you on your efficieny and professionalism, which has been evident throughout the entire project. I would highly recommend your services to others."